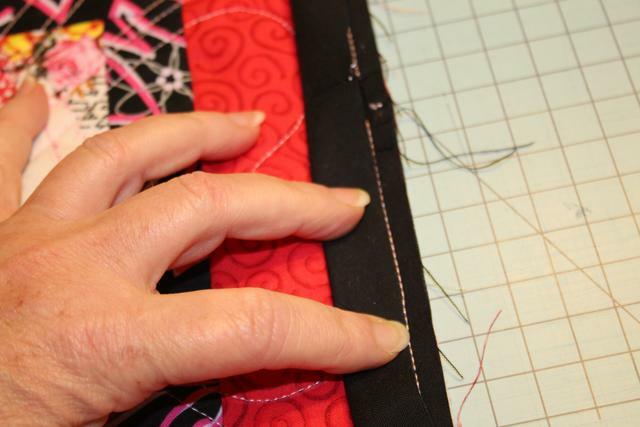 TexasMusicMom recently posted some links for different ways to do binding. Since I was in the process of making some table runners I thought why not test some of these methods and see if I like them or not. So I statred with the link she posted from Edyta Sitar. 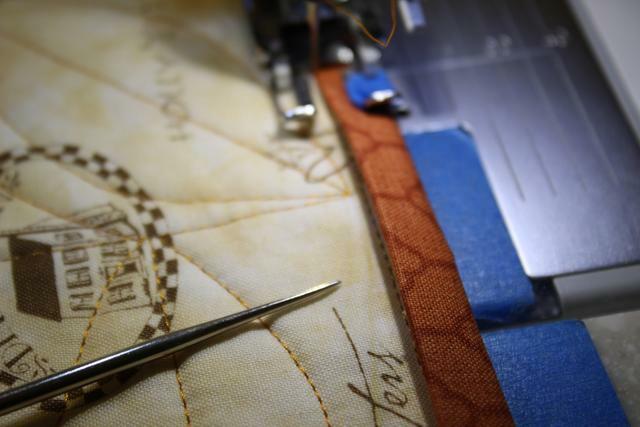 Cutting the binding narrower and folding it to the seam line after it had been machine sewn on. 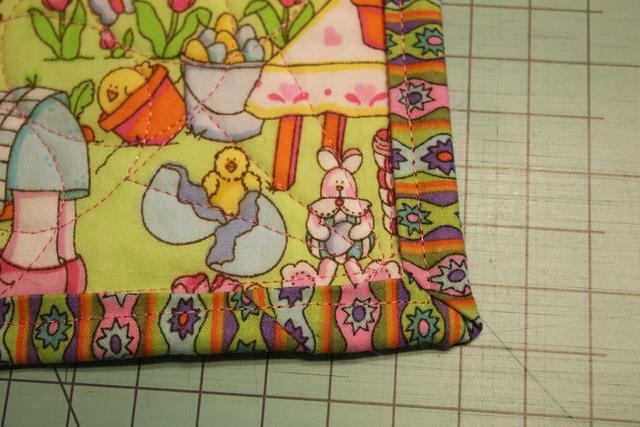 It is hard to see here because I was using black binding but you can see the pink stitches. 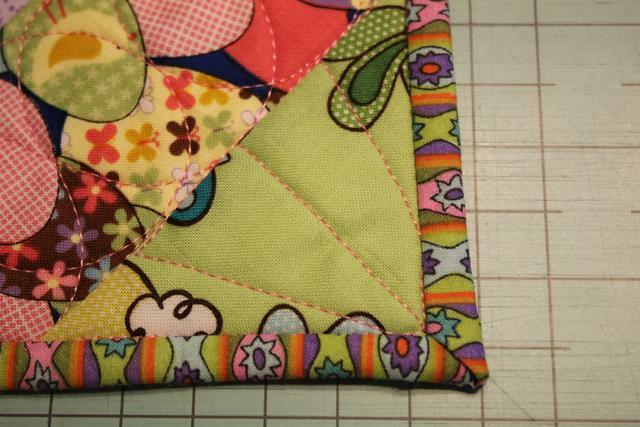 I folded and pressed it to the stitch line and folded it to the back and hand stitched it as usual. If you think you might be a bit short of the fabric you want to use for binding....this uses less and you might have enough. It does lessen the bulk a little bit in the corners but I am not sure it makes that much difference. 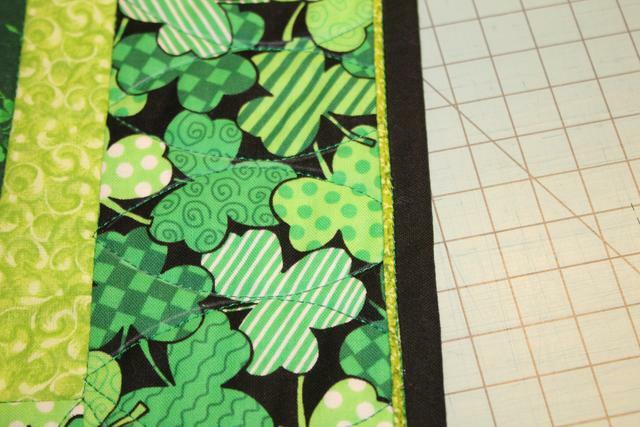 Even though I pressed the binding when I folded to the stitch line, after I flipped it to the back the shorter flap tended to pop out and I would have to tuck and then sew. It got a bit annoying after a while. Maybe a few dabs of glue would have held it in place better? Then I did the magic binding, which I have done before. 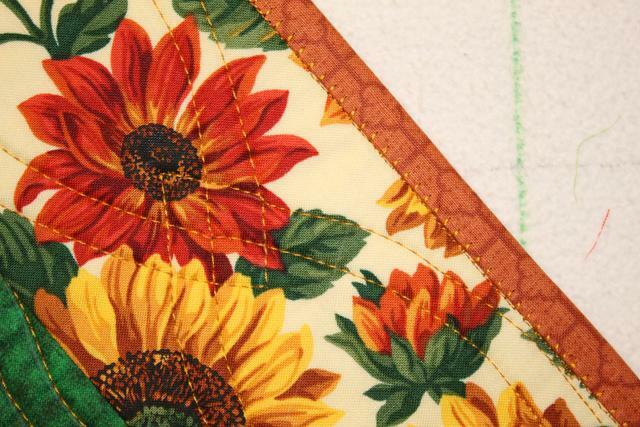 It adds a nice decorative flange and gives you a nice ditch to stitch in. 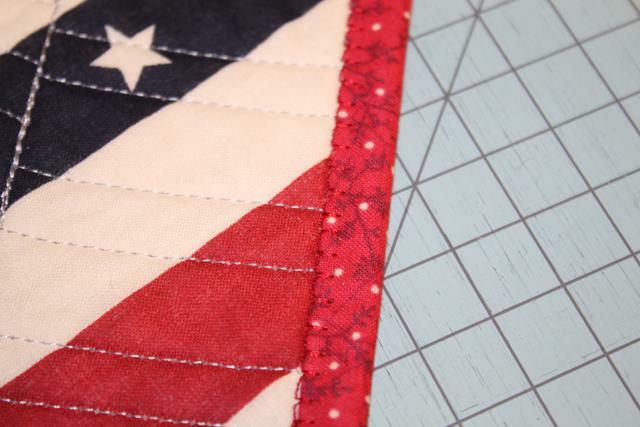 It does leave a stitch line on the back next to the binding. Some people don't care for it and some don't mind. On table runners, it didn't bother me at all. I don't mind it on kid's quilts either. I use a thread that matches the backing and it barely shows. Then I did a basic stitch in the ditch on the front where it sews down the binding on the back. Definitely my least favorite. Here is what the front and back looks like. Then I tried one on my own. Can't swear I haven't seen this on a blog somewhere but if I did, I don't know where. I sewed the binding to the front and folded it to the back. Then I used a hem type stitch...one that is straight on one edge and jumps over to the side every other stitch or so.... to sew the binding on from the back. I matched the thread to the binding and it barely showed. The weird thing is, I was sewing from the back, hoping it stayed right next to the binding on the front and it did. I actually tried sewing to the back and folding to the front and stitching, but I wasn't able to keep it as lined up. So I guess everyone would need to see what they are comfortable with. Revised: I am now sewing the binding to the back and wrapping to the front. It is better so that any little wobbles will be on the back on not the front. Note: Practice this on scraps. 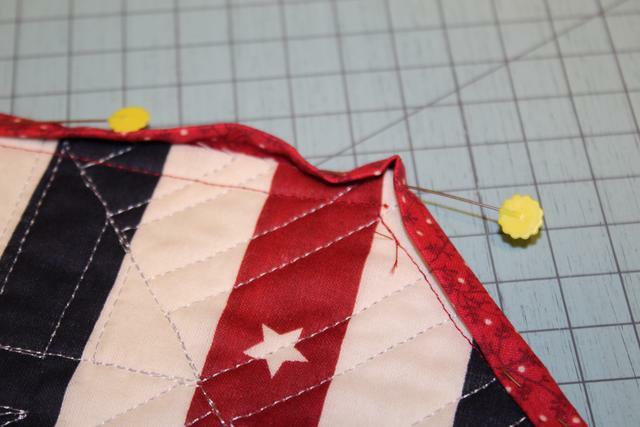 I had to adjust my qrt inch when sewing on the binding the first go round. I needed it to be a bit bigger than a qtr inch to keep the binding "full" since I wasn't just wrapping it around until it was snug. 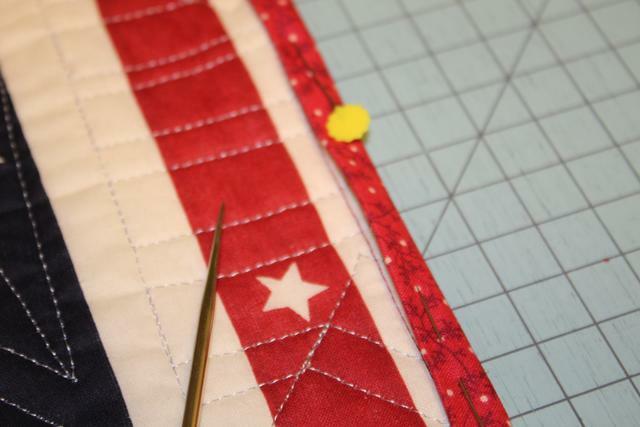 Line up your binding right next to the stitch line so that you will be sewing right next to it on the inside (center of your quilt) Pull your pins as you go along and be careful on the corners. A sharp awl is really helpful. 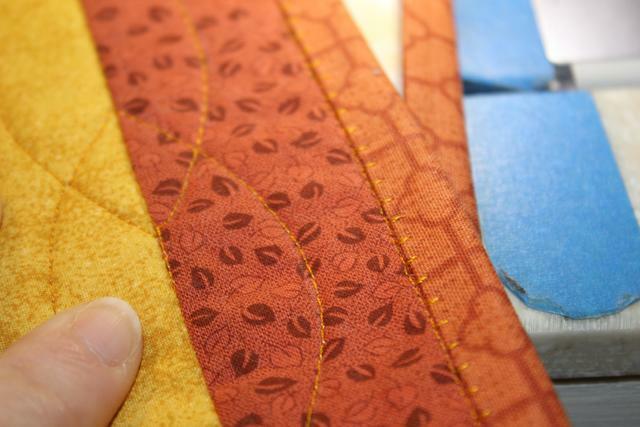 Then I used a type of blanket stitch and I liked it a lot. I will use it again and I think I will use it on baby quilts and donation quilts too occasionally. 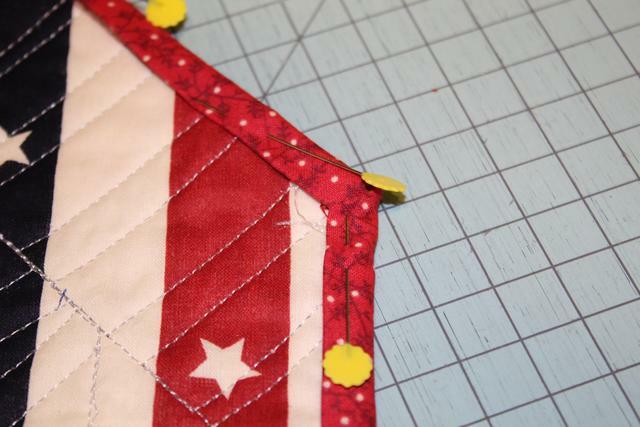 So the next time you are making small items, experiment with different ways of doing your binding. You might find one you like. Always in a Texas state of mind. TxM thanks for the binding techniques. Very informative! 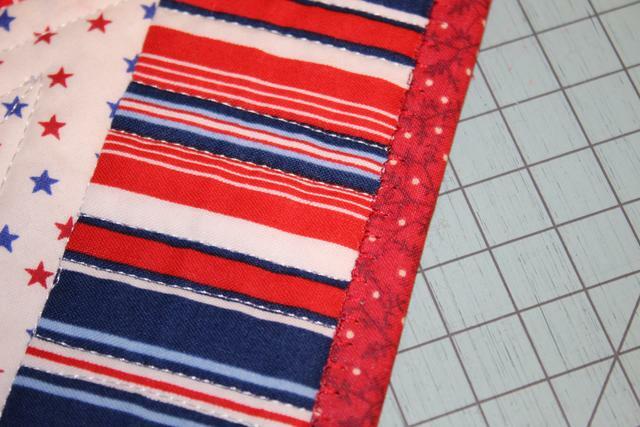 I think I will try the blanket stitch on my next runner. Wow this is awesome!!! Thank you! Definitely easier with the pictures. I'll try it as well! Thanks for sharing. That's all really helpful!! Nice job on all of it too! Thanks. If y'all try some of these techniques, let us know if you come up with an easier way to do something. 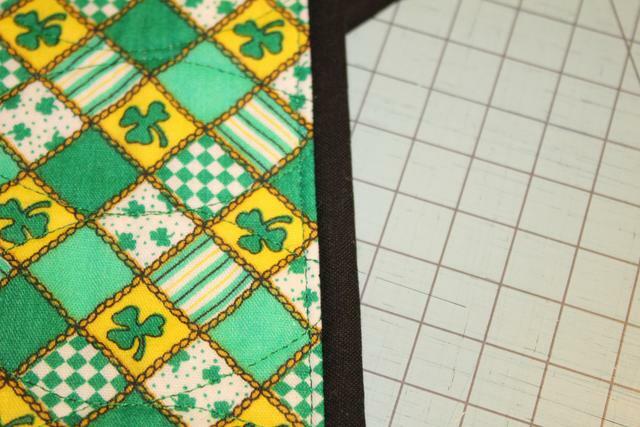 » Pieced bias binding....anyone tried it?